Kiyomaro (清麿) was born in the tenth year of Bunka (1813) in Akaiwa village, part of Komoro in Shinano Province. He was the second son of a county Samurai named Yamaura Nobukaze. His given name was Yamaura Tamaki in his childhood and later it became Yamaura Kuranosuke. After studying with his older brother, Saneo (真雄) (also called Masao), they both were apprenticed to Kawamura Toshitake (河村寿隆), a sword smith of Ueda near Komoro, and at this time, he called himself Masayuki (正行). In 1834, at the age of twenty-two, he decided to forsake sword making and go to Edo to take advantage of the current interest in military philosophy and improve his understanding of bushidô. He studied under the famous and talented hatamoto and military theorist, Kubota Sugane. 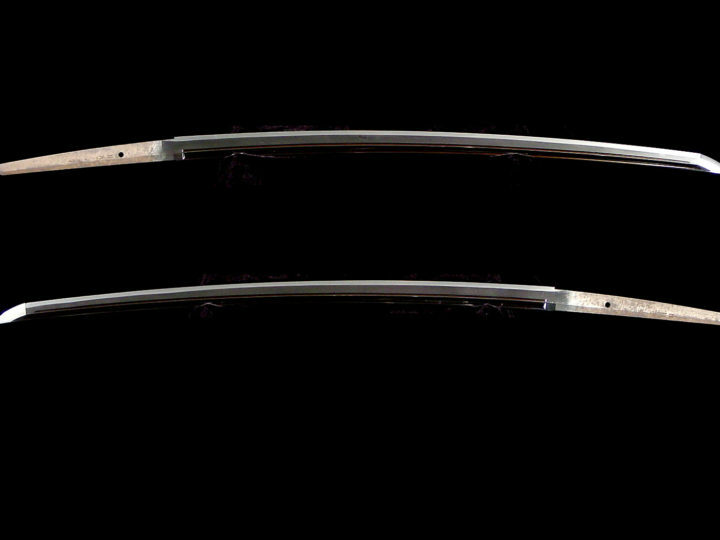 Sugane recognized Kiyomaro’s (清麿) talents and convinced him to return to sword making. In an effort to help Kiyomaro (清麿), in 1839 he organized a bukikô for Kiyomaro’s benefit. This was a kind of lottery the purpose of which was to secure orders for swords for Kiyomaro (清麿). This venture failed but Kubota was able to secure Kiyomaro (清麿) a position making swords in the bakufu’s armory. Kiyomaro (清麿) is said to have repaid his benefactor by embezzling funds from the armory in order to flee to Nagato (Choshu) which, at that time, was a political hotbed for the movement to end the Shogunate and restore the Emperor to his throne. Later, however, he returned to Edo and with the help of Sugane he established a smithy in Igachô, Yotsuya in Edo. 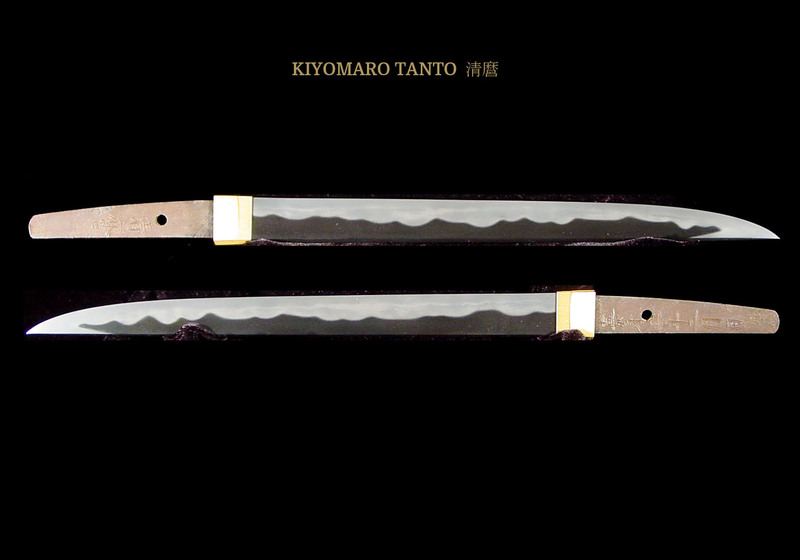 In 1846 he changed his name to Kiyomaro (清麿) and made a blade for his patron, Sugane. 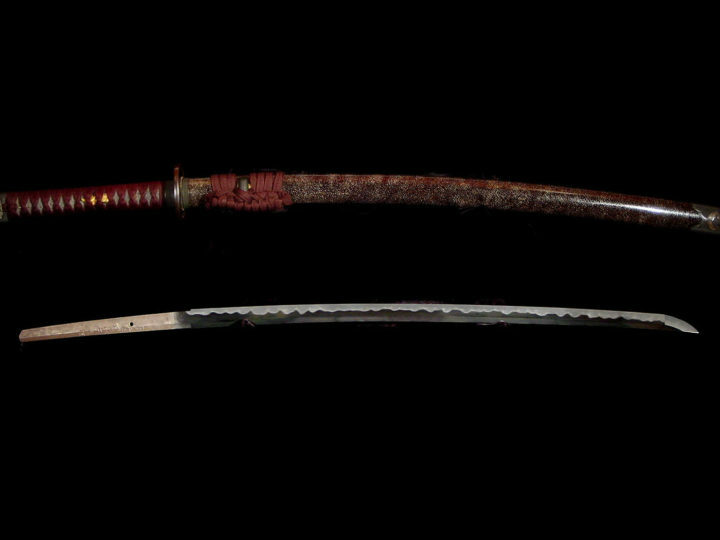 This sword turned out to be what is today considered to be his supreme masterpiece work. On the strength of the qualities of this sword and the other swords he produced around this time, he came to be called the “Masamune of Yotsuya”. Throughout his lifetime he had an addiction to drink and was often drunk. He ended his curious and brief yet spectacular career in 1854 when he committed suicide at the age of forty-two. As noted above, Kiyomaro (清麿) changed his sword name many times during his brief career. The first name he used was Ikkanshi Masayuki (一貫齋正行), then he used Hidetoshi (秀壽), later he switched to Yamaura Tamaki (山浦環). After that he went back to Masayuki (正行) and finally to Kiyomaro (清麿). Kiyomaro (清麿) is known as the best sword smith of the Shinshinto era and was on a level of the great Shinto smith, Kotetsu (虎徹). Because of his great skill and short lifespan, he is probably the most sought after sword smith of the late Edo period. His work can be classified as working in three major traditions, the Soshu tradition, the Mino tradition, and the Bizen tradition. His main focus seems to have been re-creating the masterpieces of the Shizu school of Kaneuji (兼氏) who was a student of Masamune (正宗) and the works of Samonji (左文字). Not only did he take great efforts to develop his own style, he trained many outstanding smiths to follow his teachings. The school includes Kurihara Nobuhide (栗原信秀), Saito Kiyondo (斎藤清人), Suzuki Masao (鈴木正雄), his elder brother Yamaura Masao (山浦正雄) (or Saneo) and Kanetora (兼虎) who was Yamaura Masao’s son. 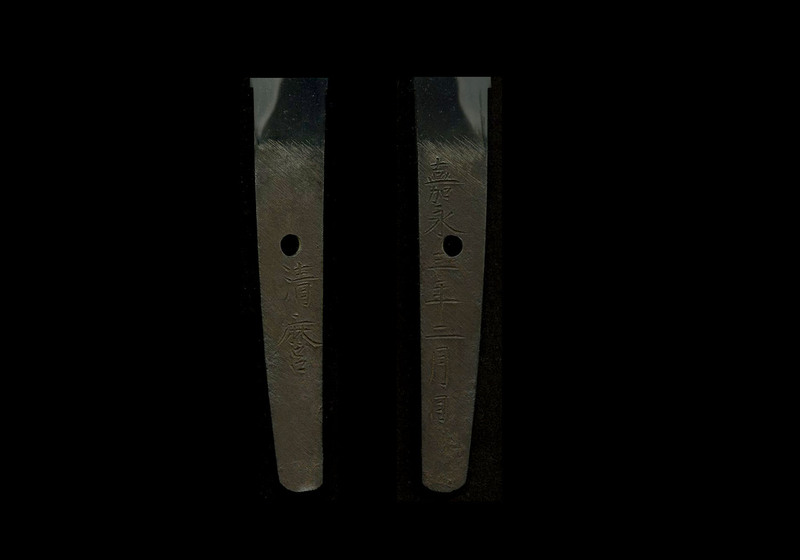 SUGATA: His early blades have a standard sugata similar to that of other smiths of this time period. As he developed his own style, his blades became longer, usually over 72 cm, with a shallow saki-zori, relatively thin kasane, and o-kissaki with a fukura that is not full. Overall the blades have a feeling of sharpness. His tanto also lack a full fukura and are forged in a variety of shapes. He favored the shobu-zukuri and u-no-kubi zukuri shapes. He also copied the shapes of Samonji (左文字). As with the long blades, there will be a real feeling of sharpness when viewing his sugata. On occasion he made naginata, nagamaki naoshi zukuri and even a few yari. Wakizashi are very rare. JITETSU: His early works tend to have a beautiful ko-mokume hada; later it becomes mokume hada or mokume hada mixed with masame hada with ji-nie and chikei. HAMON: Just as he changed his name from period to period, he changed his hamon periodically. 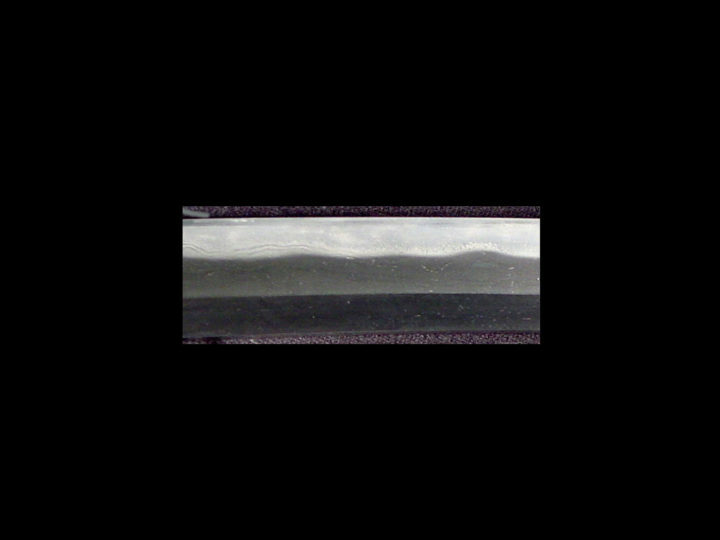 From the ko-chôji midare with a narrow nioiguchi in the style of his teacher, Kawamura Toshitaka (河村寿隆), in the beginning period, to the gunome-midare with vigorous sunagashi of the Yamaura Tamaki (山浦環) and Masayuki (正行) period, to the richly varied hamon of gunome which became fairly large in the beginning of the period when he signed Minamoto Kiyomaro (源清麿), and finally, to the ô-gunome of his twilight years in which the kashira were uniform. During the Kiyomaro (清麿) period, the nioi is made very deep and the ashi from the nioi runs deep and long and will reach the hasaki in places. Unlike the ashi of his students, the ashi of Kiyomaru (清麿) will always be at right angles to the ha and not slanted. On the peaks of the midare, there will be clusters of nie that are quite rough and it will have a high luster. Also, there will be long inazuma like effect strings that run along the hamon edge and into the hamon. Some of these run half the length of the blade or longer. (左文字) or Shizu Kaneuji (兼氏). Generally, except in his early years, his bôshi will be extended. NAKAGO: The nakago will be big and wide on katana. It will be carefully finished with sujikai or o-sujikai yasuri and end in a kurijiri shape. The mei will be chiseled thickly, powerfully, and skillfully. MEI: He had a great variety of signatures. Many swords will have dates and some will bear the name of the person ordering the blade.